WASHINGTON (THE NEW YORK TIMES)— President Trump’s time in office has been tumultuous, his term dogged by the special counsel investigation, his major legislative achievements few and his political prospects clouded by the chances of a Democratic Party midterm wave. 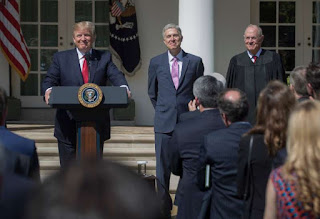 But no matter what else happens in the Trump presidency, the retirement of Justice Anthony M. Kennedy, the Supreme Court’s swing voter, set up Mr. Trump to cement a lasting legacy. Given a second Supreme Court vacancy to fill, he appears likely to go down in American history as an unusually influential president. As the first Republican president to get his judicial nominees confirmed by a simple majority vote, thanks to the abolition of the Senate filibuster rule, Mr. Trump has already broken records in appointing young and highly conservative appellate judges. Now, Mr. Trump can create a new majority bloc on the Supreme Court — one that is far more consistently conservative, and one that can impose its influence over American life long after his presidency ends on issues as diverse as the environment and labor or abortion and civil rights. If Mr. Trump secures that prospect, he will fulfill the deal that he struck during the 2016 campaign with traditional and movement conservatives who were skeptical of his politics and hesitant about supporting his candidacy. They feared he would pick an idiosyncratic nominee, like a celebrity lawyer he saw on television, rather than an authentic conservative. But Mr. Trump shored up Republican turnout in the election by promising to select Supreme Court nominations from a list of conservative judges. It was shaped by his top legal adviser, Donald F. McGahn II, now the White House counsel, who worked with advisers like Leonard Leo, the executive director of the Federalist Society, the conservative legal movement network. Court-focused voters helped deliver Mr. Trump’s narrow victory over Hillary Clinton, exit polls showed. Mr. Trump picked from his list to fulfill his first vacancy last year, choosing Neil M. Gorsuch to replace Justice Antonin Scalia, a staunch conservative. Since then, debates among conservatives about his unruly presidency have been characterized by a joking shorthand for what traditional Republicans got in return: “But Gorsuch.” In November, the White House quietly issued a revised version of the list in case another vacancy arose. It is filled with young and conservative appeals court judges — including runners-up from the last vacancy’s short list, like Thomas M. Hardiman, Raymond Kethledge, William H. Pryor Jr. and Amul Thapar; Brett Kavanaugh, an appeals court judge Mr. Trump added to his options in November; and several women, including Amy Coney Barrett and Joan L. Larsen, both newly minted appeals court judges appointed by Mr. Trump. Conservative legal advocates fervently hope Mr. Trump sticks with his vow to pick one of those nominees or someone similar to complete a historic remaking of the judiciary. “This is a second opportunity for President Trump to fulfill what is, to me, his most important campaign promise — that he would put justices on the court who would be faithful to the Constitution, fair, and impartial,” said Carrie Severino of the Judicial Crisis Network, which advocates on behalf of confirming conservative judges. Liberal legal advocates see the stakes as similarly huge, but view Mr. Trump’s good fortune in a decidedly more negative light. Nan Aron, the president of the liberal Alliance for Justice, said that Justice Gorsuch’s record on the court makes clear that putting another justice in his mold into Justice Kennedy’s seat represents a drastic threat. “The danger is that the Supreme Court, at the behest of this president, will favor the wealthy and powerful and extremist groups at the expense of everyone else — not just for President Trump’s term, but for decades to come,” she said. The prospects for the nominee’s confirmation will most likely come down to how a handful of moderate senators will vote. Senators Susan Collins of Maine and Lisa Murkowski of Alaska, both Republicans who support abortion rights, are considered key votes in a narrowly divided Senate, as are Senators Joe Donnelly of Indiana, Heidi Heitkamp of North Dakota and Joe Manchin III of West Virginia, all Democrats up for re-election in states that Mr. Trump won. While conservatives expressed quiet confidence, liberals vowed to fight. On top of perennial issues like whether abortion will remain legal and available, several took note of other issues at play, including the Affordable Care Act and the Trump administration’s recent indication that it will try to use the courts to dismantle the law’s popular protections for people with pre-existing conditions. Adding to the court a pick from Mr. Trump’s list creates the “prospect of a conservative majority over a long period of time,” even if Mr. Trump loses to a Democrat in 2020 who could restock the court’s liberal minority, said Edward Whelan, a conservative legal commentator and the president of the Ethics and Public Policy Center. But Mr. Whelan said he was optimistic that the fight over the new vacancy would help Republicans maintain control of the Senate in the midterm elections by keeping the courts as a primary topic of political conversation in the coming months. Securing the Republican Senate majority could allow Mr. Trump to create an even more enduring achievement if a liberal justice’s seat opened, perhaps for health reasons, in the second half of his term, Mr. Whelan said. The president could then add another right-wing justice to the court.